This game was played in sub-zero temperatures but credit to the Downpatrick players for putting in a solid performance. Downpatrick created a couple of chances but couldn’t convert them, then they conceded from a corner against the run of play. 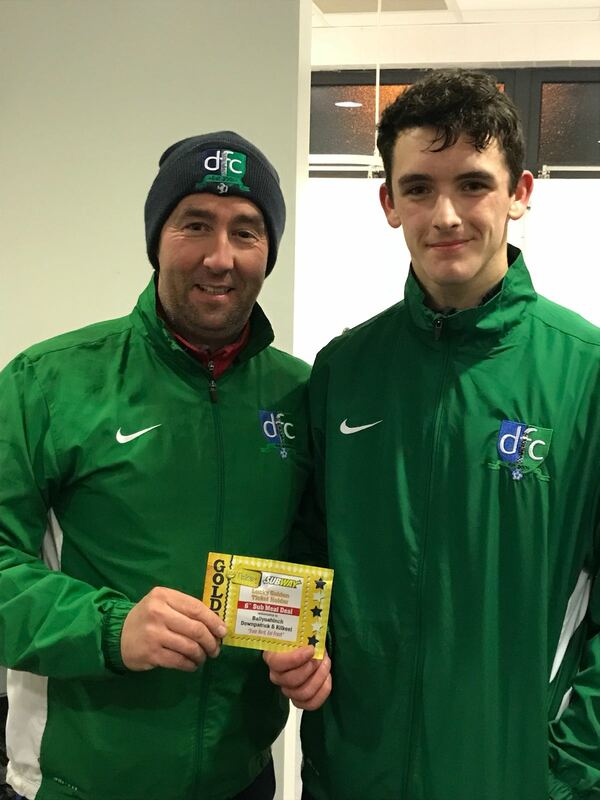 After a bright start and conceding early Downpatrick took control on the half hour mark when Andrew McCoubrey replied with a quick fire hat trick in the space of 7 minutes. He tucked away his first after Ryan McKinney drove down the right wing and crossed for McCoubrey to rifle his shot into the bottom corner, his second was a brilliant drive from midfield and a shot from the edge of the box and his third showed his class as he converted a free kick from the left side of the box. At this stage Downpatrick were rampant and in total control with Adam Jervis, Joe Healy and Corey McCoubrey controlling the midfield. Healy then released Tony Carson who hit a screamer from the left side of the box into the far right corner of the net. Downpatrick continued their scoring form in the second half, Joe Healy finished of a six pass move with a sublime dink over the onrushing keeper. Carson was at again this time it was only a tap in from the penalty spot as he finished a move which he started. Sam Kinnear who was making his debut one to remember when smashed his shot into the bottom corner of the net just before the end. For all the attacking prowess Downpatrick showed they also had a solid platform to play from with a lot of credit going to their goal keeper and defence who also had great games.